8am	All day entries for events taken at the secretary van DOUBLE ENTRY FEE. FARMER CHALLENGE - to be conducted at the half time break of the Junior Rodeo approx. 5pm. All Championship Competitors will be required to enter the Camp drafting CATTLE WORKING SHOOTOUT CHALLENGE to complete the Championship Challenge! 1. All competitors will be required to pay an event entry fee of $35 Adults or $10 Child along with event entry fees and lodge their entries. Entries close 14th December 2018. Entries will be taken on the day at double class fee. 2. All competitors & “Strappers” will be issued with wristbands. Without wristbands full entry fees apply. 3. The event fee will give each competitor access to the two-day event & entertainment. Competitors are allowed one “strapper” that the same applies. ‘Strapper” to be named with entries. 4. Stockman Championship awards will be presented prior to the commencement of the Junior Rodeo. All other prizes will be allocated at the completion of the class. 5. 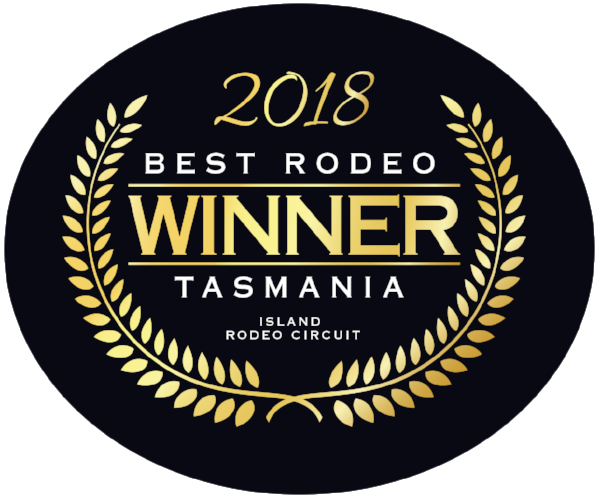 Junior Rodeo commences 5pm Sunday 30th December 2018. 7. Competitors must wear wrist bands at all times. 8. Buckles for All Round Cow Girl, All Round Cow Boy, Junior Highpoint Cowgirl & Junior Highpoint Cowboy. The competitors in each category who wins the most points in 2 or more events are eligible. 9. Buckle presentations will be presented in the arena immediately after the completion of the junior events and the completion of the open events. 10. The committee reserves the right to limit entries. 11. Early entries and cancel out conditions apply. 12. All junior competitors must wear their helmets both inside and outside the arena whilst on their horse. 13. Local Steer Ride and Local Barrell Race entries to the Smithton Rodeo Committee smithtonrodeo@outlook.com via online registration. Day members can enter online prior to the event NO entries taken on the day. 14. Designated warm up area. 15. Horses are to be yarded to the satisfaction of the Smithton Rodeo Committee. Size of yards to be kept to a minimum. 16. Vet & Farrier will be available for emergency treatment of horses with any fee’s incurred payable by the owner. 17. BYO hay – No hay available to purchase on site. 18. No glass or BYO alcohol permitted onsite – vehicles will be checked upon entry. Glass and BYO alcohol will be confiscated on entry and at camps. 19. Camping Conditions – camping for competitors and their families only and will be cross referenced from the list of nominations for eligibility. 20. No camping prior 4pm 29th December 2018 and the grounds must be vacated by 4pm 1st January 2019. 21. Camping grounds will close at 10pm Saturday 29th December 2018 & will reopen 7am 30th December 2018 until 10pm and then reopen at 9am 31st December 2018. 22. No visitor vehicles are permitted in competitors camping area. 23. Dogs are to be on a leash at all times. A $150 on the spot fine will be issued if dogs are not secure – no exceptions. 24. A “No Barking “rule applies. 25. Noise level restrictions apply. 26. Spectator camping will be separated into two sections. 1. Spectator family & quiet area with 10pm noise restriction and 2. Other spectator camping with noise restriction of 12pm. 27. No vehicle movement after 8pm unless arriving or departing. 29. Limited water available campers advised to bring their own water. 30. No 2 or 4-wheel motorbikes permitted on site unless competing in the Horse V Horse Power event. 31. Drunken disorderly behaviour will not be tolerated. Anyone displaying antisocial behaviour will be removed from the venue and prohibited to return.